Most people take infrastructure for granted, until something goes wrong. When repairs need to be made, access to accurate data is essential if the problem is to be resolved in a timely manner. Traditionally, utilities use the original construction plans as their system of record. Relying on paper plans for asset management is risky. Paper plans can be misplaced or out-of-date – not matching what is in the field. This can cause serious problems during an emergency. Geographic Information Systems (GIS) offer an accurate, accessible database for both emergency response and long-range planning. R.G. 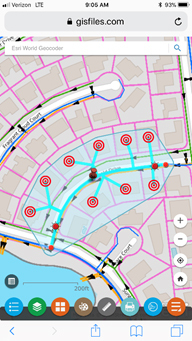 Miller provides real-world infrastructure mapping for municipal utility districts, water districts and cities. We create asset management solutions built on the Esri platform – the world leader in mapping and spatial analytics software – deploying Esri’s suite of mobile maps and apps to provide a comprehensive system of engagement. Take your maps with you wherever you go with Explorer for ArcGIS, a mobile app for iOS and Android. Modernize your inspection process by using the Collector for ArcGIS app for iOS and Android. 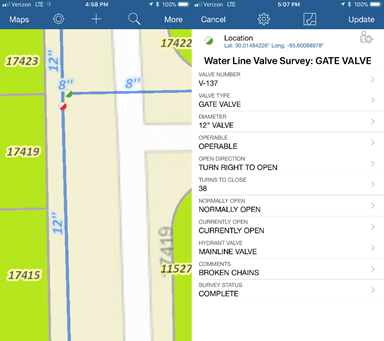 Complete hydrant inspections and valve surveys using a map view directly in the app and preconfigured data options for fast and accurate data entry. 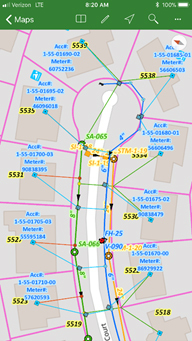 The Utility Isolation Trace app allows field personnel to pin a location on the map, such as a main break, and determine which valves to close and what customers will be out of service.